They seem to have lived in Eversholt from around 1845 to 1850. They don’t appear in the census records. It would be very laudable if someone were to lay out £9 for a copy of the birth certificate of one of the Pinckney sons, so we could see if they were born in Eversholt House, which is probably what Linden House was then called. I (EJW) haven’t found any record of him in the church, and the Pinckney website above says he was curate at Moulsoe in 1845. Moulsoe is 10 miles from Eversholt. A little oddly, the oath of witnesses to the will of the Rector in 1843 was taken by “W. P. Pinckney”. Was he a lawyer, or a priest? Or perhaps priests were allowed to administer oaths back then. (Click the picture for a much bigger version). A copy of the picture was sent out as a home-made Christmas Card by Brian Scott when he lived in Brook End House. Brian moved away about 2005 and I’m told he has since died, so we don’t know where he found it. 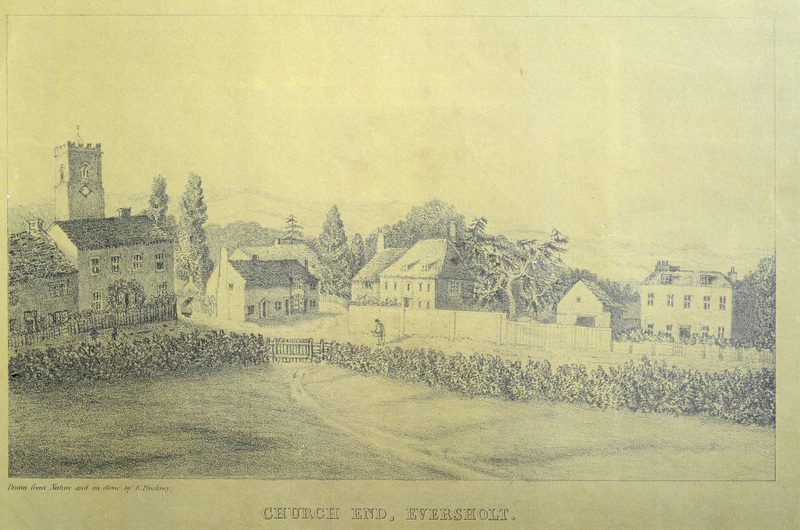 The caption says, “Church End, Eversholt” and the tiny writing says, “Drawn from Nature and on Stone by E. Pinckney”. Presumably, this was Etheldred Pinckney, drawing around 1845. It is indeed a view of Church End, from an observer standing in the field opposite School House and Linden House. The artist has taken rather large liberties with the perspective in order to show Church Farm. On the left of the picture is School House, with the church tower behind. Next comes the building that is now the Old Post Office. Then Church Farm, with trees behind. Then on the right, the building that is now Linden House. Is that a clock on the church tower? The church clock is rumoured to have been installed in 1890, although that is confusing. Or maybe it was a sundial in 1845? The earliest photos we have of the Post Office show it as the two-storey building that exists today. It must have been enlarged sometime later in Victorian times. Here is a photo from vaguely the same direction, taken from the field. Emrys Williams took this photo in 2012 and places it in the public domain. (I had to sneak along the hedge just off the public footpath, forgive me please!) The actual viewpoint is imaginary, the artwork is not intended as a precise record. It’s interesting that the artist draws School House and what is now Linden House and Church Farm, but misses out Wakehams, the cottage just off the right of the picture. Was she drawing the posh houses and omitting the cottages?